Come to Parkers for our mouthwatering meats and sides & make your function one for everyone to remember! The showground events … a growing part of our operation where a mixture of personal skills and customer service are important as repeat visits for food are often a part of a day’s affairs. 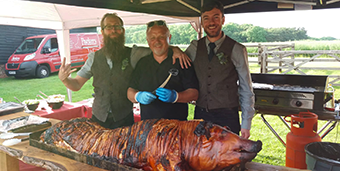 Parkers are one of the top UK hog roast and BBQ caterers and we have such pride in our service that you and your guests will be talking about us for many years. Parkers will provide you with the best locally sourced produce to make our homemade sauce and locally reared Meats. Corporate events are a speciality for Parkers and we have attended some prestigious events where we are really in our element, sometimes catering for as many as 300 people with 2 machines on the go and a selection of pork, chicken and other meats. We have our own team for these type of events to make sure the day runs smoothly. We’d like to say a huge thank you to Parker’s Hog Roast! They catered for our wedding on the 26th of May and they were absolutely fantastic- they really made the day that much more special! All our guests were so impressed with the food and it really was delicious- they were really flexible with what we needed too. Wouldn’t hesitate to recommend to anyone. Thanks so much to all involved! We can offer the most amazing accompaniments be it canapés, salads or desserts making your event with us unique. Parkers are one of the top UK hog roast caterers and we have such pride in our service that you and your.